Earlier this month, the New York Times reported that AT&T, the new parent company of HBO, was asking the premium network to change. The demands: produce more content; become something "bigger and broader." 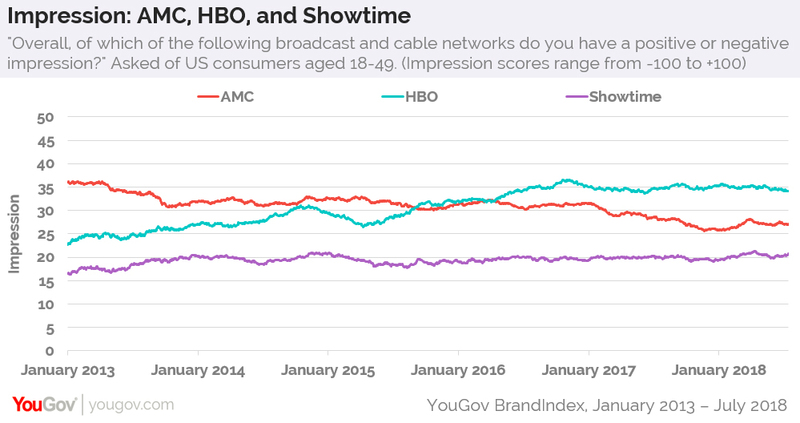 Still, despite the modifications occurring within HBO, and the disruption in TV-viewership happening all around it, data from YouGov BrandIndex shows that US consumers aged 18-49 have had an increasingly positive view of the network over the past five years. For example, HBO’s Impression score — which asks respondents if they have an overall positive or negative impression of a particular brand — has climbed from 23 in January 2013 to 34 today. Meanwhile, rival AMC, known for Mad Men, Breaking Bad, and The Walking Dead, has moved in the opposite direction, decreasing from 36 to 27 during the same time period. Showtime’s Impression score has remained relatively flat, increasing from 17 to 21. HBO’s Satisfaction score, which tracks both current and former customers, has followed a similar path. Just over five years ago, the network behind Game of Thrones and The Sopranos sat at a score of 15. At present, that number has grown to 27. 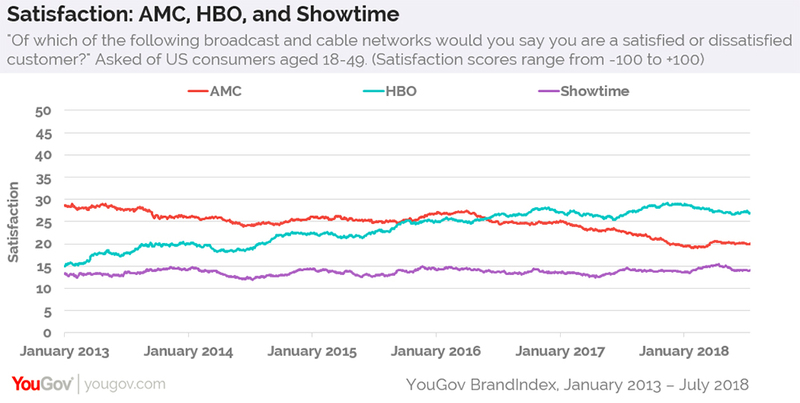 AMC again lost the lead to HBO, experiencing a drop in customer satisfaction from 29 to 20. According to data from YouGov Profiles, 26% of US adults aged 18-49 who have a positive impression of HBO feel that they have too many subscriptions to services such as a Netflix or Spotify. The same is true for 29% of all consumers in the same age group.